Last-minute engine failure appears to cause Beresheet to crash. Netanyahu: We will try again. The Beresheet spacecraft failed to land on the moon Thursday evening after its main engine failed. The landing process started at 10:05 PM Israeli time. The craft was supposed to touch down on the lunar surface approximately 20 minutes later, but appears to have crashed. Prime Minister Binyamin Netanyahu, his wife Sara and his son Yair arrived at the control room in Yehud to watch the landing live. "Today we have unlimited pride and joy. The Israeli spacecraft is about to reach the moon and hope it will be successful," Netanyahu said. "It is already possible to say that this is another important step for humanity and a giant step for the State of Israel, and Israel is the fourth country in history after three world powers to make this arrival," added the prime minister. Following the engine failure, Netanyahu said that the launch and successful orbit were still a tremendous achievement for Israel. "If at first you don't succeed, you try again," the prime minister said, adding that Israel would have a spacecraft land successfully on the moon within the next two to three years. The spacecraft was launched from Kennedy Space Center in Florida on February 22 and has traveled four million miles in its journey to the moon. Israeli NGO SpaceIL and state-owned Israel Aerospace Industries (IAI), the two main partners in the project, describe Beresheet as the "world's first spacecraft built in a non-governmental mission," with philanthropist Morris Kahn providing $40 million of the $100 million budget. Israel sought to become the fourth country to put a spacecraft on the lunar surface, following the United States, Russia, and China, but will have to settle for being the seventh to achieve orbit around the moon instead. Beresheet carried a scientific instrument to measure the lunar magnetic field, which will help scientists to understand how the moon formed. The data collected by the spacecraft was to be shared with NASA. 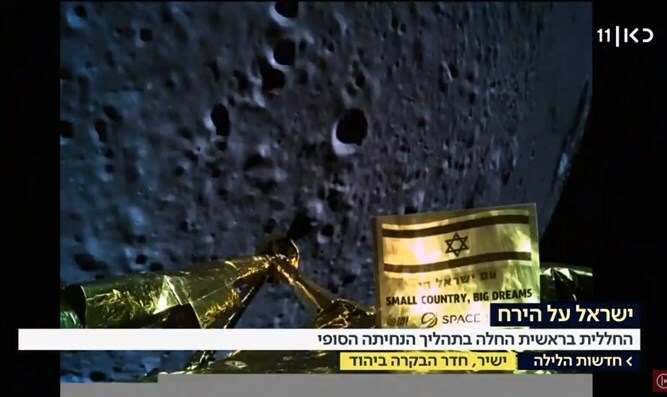 The spacecraft also carried a "time capsule" containing digital files including a Bible, children's drawings, Israeli songs, the memoirs of a Holocaust survivor, and a blue-and-white Israeli flag. Israeli President Reuven Rivlin shared his excitement prior to the landing attempt. "Dozens of kids who are passionate about science and space, from all over the country, have come to Beit HaNasi to see the landing of the spaceship on the moon tonight. Good luck 'Beresheet'!" Rivlin said. "This is an important night for the State of Israel," he said.